TEA Laser in operation. In this photo, the beam-spot is shown on plain paper, in top centre of image. (It is the blue dot on white envelope paper). A re-designed spark-gap substantially improved laser operation. The laser can be run up to roughly 20,000 volts DC, and beam spot intensity appears to increase linearly with voltage. The power supply can deliver higher voltages (roughly 35 KVDC), but the 1 megaohm resistor array gets overheated. The atmosphere is roughly 78% N2 (nitrogen molecules), and these can be effectively lased, under the right conditions of rapid electrical discharge from a low-induction capacitor. The beam is invisible ultraviolet, at 337.1 nanometers wavelength, but it will glow blue on white paper. Power supply was borrowed from the Fusion Reactor, which is offline for upgrading. Dielectric Breakdown in the Aluminum Foil Capacitor. Overvoltage causes the capcitor to fail, with an explosive hole punched thru the acetate dielectric insulation. Back-of-the-Envelope N2 TEA Laser Beam-spot. 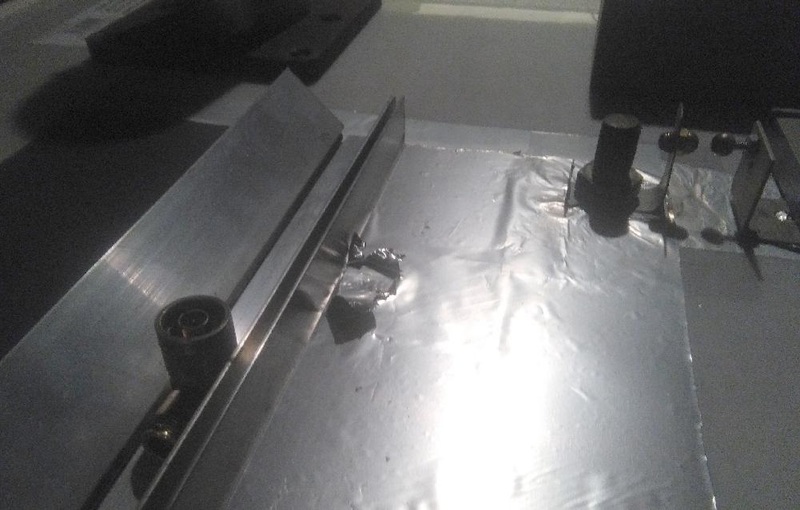 Modifications to both capacitor and electrode rails improves focus, as well as a small optical-grade mirror at back of laser seems to improve beam focus and quality. 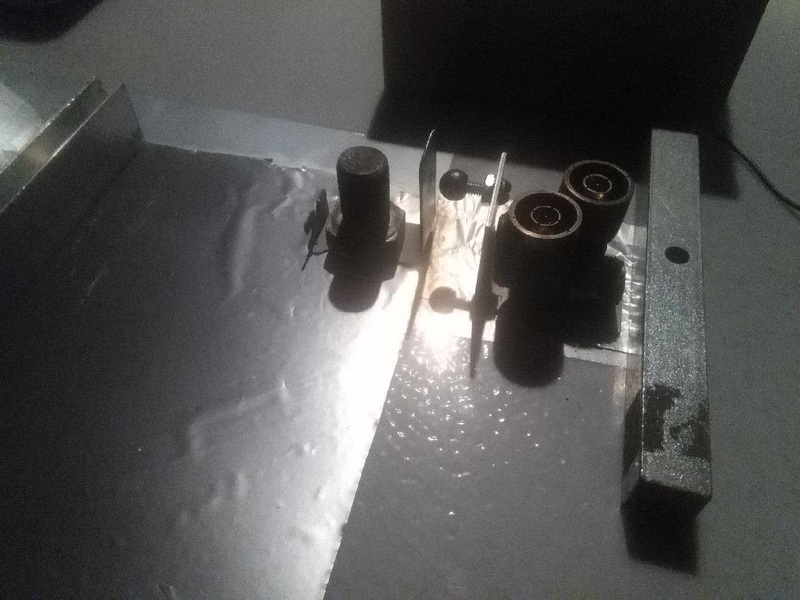 Laser runs now with two layer acetate dielectric, which allows higher sustained voltages (14 to 17 kvdc), but without evident dielectric breakdown (so far...). Amazing what can be built with some bits and pieces from TSC Hardware, Staples Office Supplies, and Home Depot. 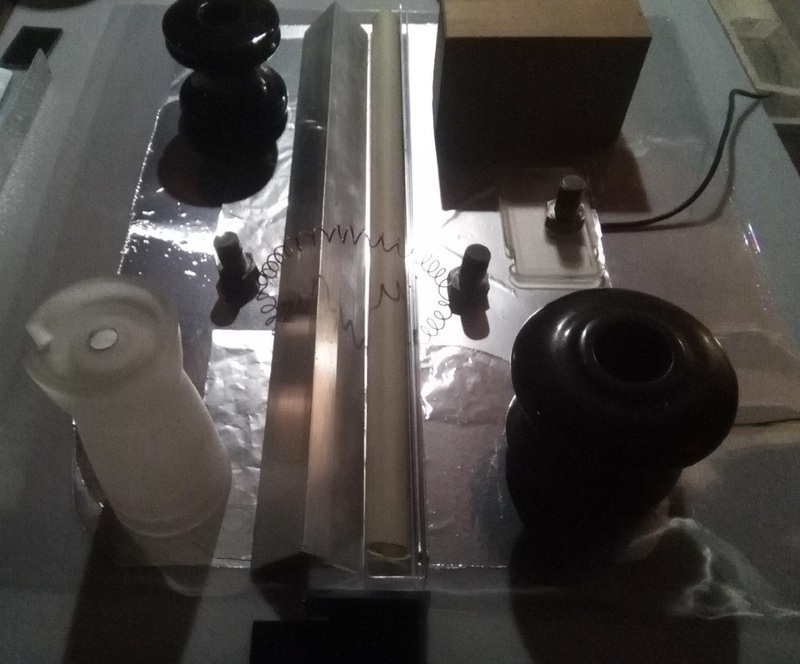 If constructing a N2 TEA Laser, make sure to wear hearing protection, wear plastic UV-blocking goggles (test by confirming beam is *fully* blocked if you shine it thru them onto paper - you should see no beam spot), and use insulated rod or screwdriver with one hand only, to make minor electrode rail position adjustments if necessary. Voltages of > 10,000 dc, with 50ma of current can stop your heart dead, if you get current flow up one arm and down another. If you are not familiar with working with high-voltage circuits, read up on safety protocols first, before switching anything on, and then follow the rules. I set the exposure to emulate ISO 800 filmspeed on my Huawei cellphone to capture this image. The beamspot has a cleaner focus with better geometry, but it is still not spherical, indicating the beam is dispersing. At present, no optical focusing is being used. Earlier spark-gap design. This was improved to use two spherical electrodes, with a seperation of roughly 4 mm. Improved spark-gap switch. The use of two spherical electrodes here seemed to improve the laser operation. Detail of N2 TEA Laser Electrode Rails and Capacitor. This configuration - left rail a piece of 1 and 1/2 inch aluminum, and right rail, two nested 1-inch (thinner) aluminum rails, weighted by a cylindrical steel rod, inside of a plastic pipe. Right side of capacitor is slightly smaller than left side. 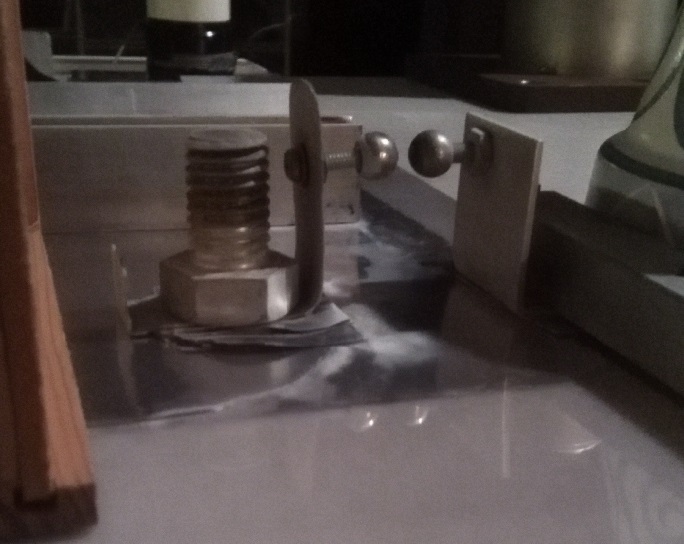 Inductor of twisted copper wire, connected to capacitor plates in centre, held to plates by weights of two steel bolts, worked best, as a 1 meg resistor grew too hot, and did not work as well. Note that the right rail, which is two nested L-pieces, has the top L-piece shifted towards the left rail, about 2 or 3 mm, so that the top piece projects out above the capacitor plate, and interacts with the 90-degree edge that the inverted angle-piece of the left side projects. This rail geometry was the *only* setup that would yield good laser action, and only after very careful adjustment of the inter-rail gap is made. The two electrical insulators and the glass artifact at the bottom left of the image are there to weight the capacitor plates and dielectric, and thus reduce the capacitor induction, which is important in this design. Several other rail geometries were tried, and most would just not lase, but this configuration lases surprisingly well, once adjusted. Adjustments are made by gently tapping on the right side rail only, so that an inter-electrode gap of roughly 1.3 at the rear, and 1.4 to 1.7 mm at the front is achieved. (The distances are estimates only). Another point of note is that the power-supply was modified to reverse it's original polarity, so the bottom plate of the capacitor (the "ground" plate is positive, and the top two plates are negative. This was because the Molectron power supply was used to power an IEC fusion device, which requires high-voltage negative on the ion-containment electrode. 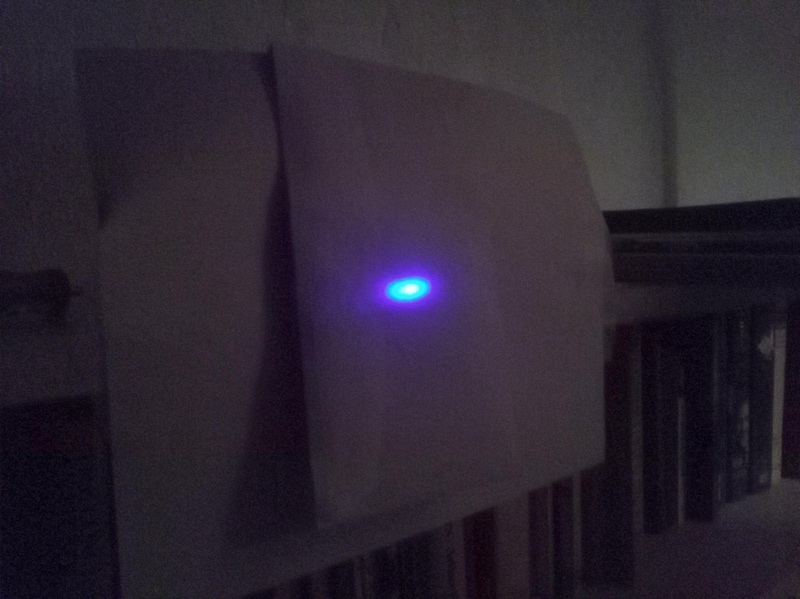 This particular rail configuration lases surprisingly well, and projects a bright violet-blue beam-spot on white paper. (The ultra-violet laser beam, at 337.1 nanometers wavelength, is of course, completely invisible to human eyes, and only reveils itself when it interacts with a target. 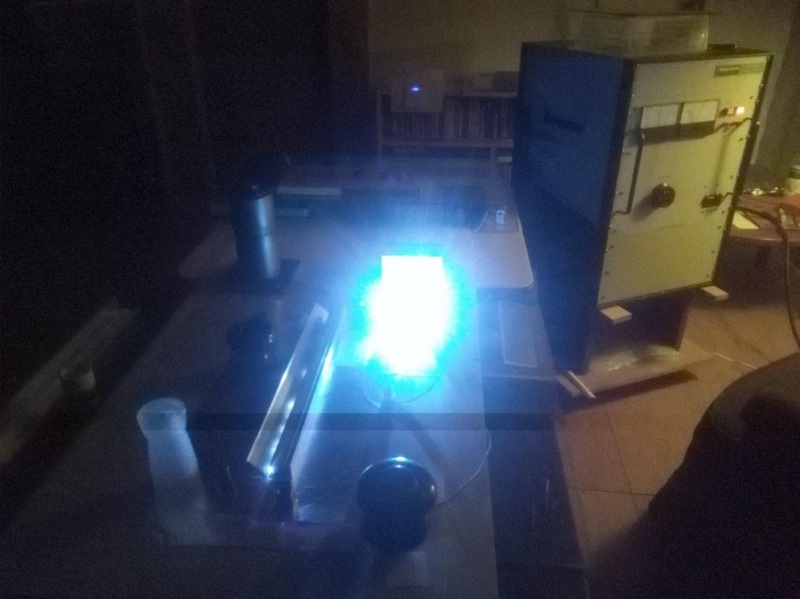 If one coats a piece of paper with yellow highlighter (from the yellow markers used to highlight documents), you can observe an extremely bright beamspot, as the UV light reacts to produce a very bright glow. 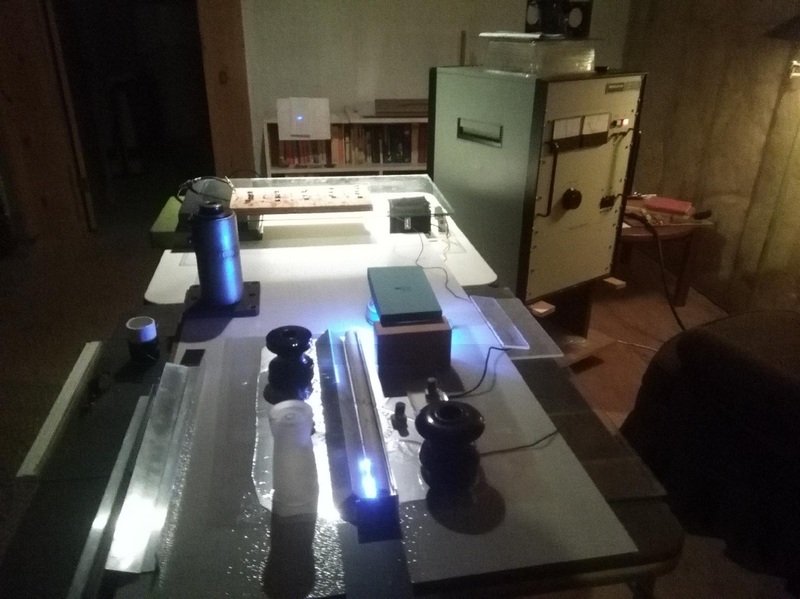 Here is TEA laser operating with bright room lights on, and the spark-gap covered. You can see the beam-spot on the back of a white envelope in top centre of image, and also the array of 1-megaohm resistors, in a 5x5 array, which are necessary to limit current, so the power-supply is not overloaded (the spark-gap basically creates a short-circuit to discharge the capacitor). This configuration draws about 5 ma as indicated on the meter, and runs at approximately 14,000 vdc. The resistors are 1 watt, and should be bigger, as they get too hot if the laser is run for several minutes. The electrode rails are 46 cm in length, and require adjustment *while the circuit is in operation*, which makes this configuration very dangerous. All the protocols associated with working with high-voltage *must* be observed to avoid injury.